King David allowed a sinful thought to enter his mind about a woman named Bathsheba. He allowed his thought to lead to other sins, and he suffered greatly for these sins. 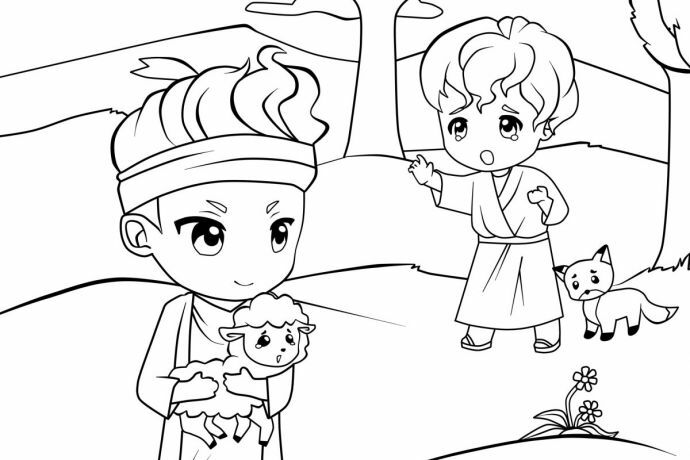 Nathan told David a story about a rich man who took the pet lamb of a poor man. It was in the spring of the year, and Israel was at war with the people of Ammon. King David sent Joab and his soldiers to fight Ammon. But David remained at Jerusalem. One evening David decided to go outside. He looked over at another house and saw a beautiful woman bathing. Instead of turning away, he allowed himself to think about wanting this woman. David sent messengers to her, and she came to him. David committed a sin by taking another man’s wife and treating her as his wife. David came up with a plan to make it seem as if Bathsheba’s husband, Uriah, was the father of the child, not David. He would have Uriah sent home so Uriah could be with Bathsheba, his wife. Then everyone would think Bathsheba was having Uriah’s child. When Uriah arrived, David told Uriah to go to his house and clean up. David was hoping that Uriah would then spend some time with his wife, Bathsheba. But Uriah didn’t go to his house. Instead he slept at the door of the king’s house. David invited Uriah to eat and drink with him. Uriah drank too much and became drunk. In the evening he went out to lay down near the king’s house. He didn’t go to his own house as King David again was hoping he would do. Joab sent Uriah to a place where he knew there was a fierce battle raging. Then the men of Ammon came out and fought with Israel. Some of Israel’s soldiers died, and Uriah died also. When Bathsheba heard that Uriah, her husband, was dead, she mourned for him. When she was through the mourning time, David brought her to his house, and she became his wife. She gave birth to David’s child, a son. But in all this, David had sinned and displeased God. Then God sent Nathan, a prophet, to David. He told David a parable (like a story or example). “There were two men in one city, one rich and the other poor. The rich man had many flocks and herds. The poor man had nothing, except one little lamb. It grew up with him and his family. It was a pet lamb, and the family loved it very much. Then Nathan said to David, “You are this man! The LORD God says: ‘I made you king over Israel, and I delivered you from Saul. I gave you Saul’s house and gave you Israel and Judah. And if that hadn’t been enough, I also would have given you much more! Nathan left, and David and Bathsheba’s child became ill. David pleaded with God to heal the child. He also fasted and laid on the ground at night. He wouldn’t eat any food. On the seventh day the child died. David’s servants were afraid to tell him that his son was dead. When David saw his servants whispering, he knew that his child had died. David got up from the ground, cleaned up and changed his clothes. He went into the house of God and worshipped God. He was hungry and went to his own house and asked for food. His servants brought him food, and he ate. Then David went to Bathsheba and comforted her about the death of their son. Later, she had another son for King David. He called his name Solomon. For most of his life, King David obeyed God. He loved God. But he allowed these sinful thoughts to enter into his mind. As a result, he sinned greatly against God’s laws. David was sorry and repented of his sin, and God forgave him. God still loved David. When we sin, we need to repent and be sorry that we disobeyed God’s laws. God is merciful to us and will forgive us all our sins. You can read this story in the Bible in 2 Samuel 11-12. What did King David do when he found out Bathsheba was going to have his child? How did he plan on having Uriah killed? Was God pleased with King David for what he did? Did God forgive David for his sins? Does God promise to forgive us when we are sorry for our sin and quit doing what is wrong? David and Bathsheba were later blessed with another son, who would become the next king after David died. What was this son’s name?